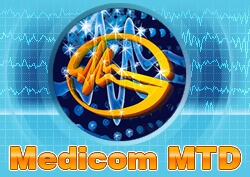 Medicom MTD: Videomonitoring kit for EEG-video and software "Encephalan-Video"
Completely synchronized continuous multichannel record of electroencephalogram and video on a patient's state is a "gold standard" for differential epilepsy diagnosis. Diagnosis of epilepsy and epilepsy syndromes. Idiopathic paroxysmal states, raising suspicion of epilepsy. Drug-resistant seizures (in order to identify pseu­doepileptic paroxysms or specify the form of epilepsy). Monitoring the effectiveness of treatment. Pharmacological remission (objective statement of remission). Preparation for the abolition of anticonvulsant therapy. Progressive cognitive and behavioral disorders in children. Video-EEG monitoring has no contraindications. 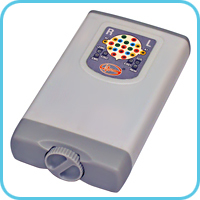 or continuous telemetric EEG monitoring when patient transceiver-recorder ABP-26 is placed on the waist of the patient. In this case, EEG record is provided both in the patient ward (with EEG videomonitoring) and outside of it with an option of autonomous record on a memory card of ABP-26 (Holter-EEG record without video). 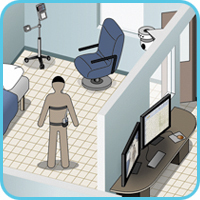 Kits of video equipment provide video record synchronized with EEG data for an objective monitoring of movement and paroxysmal activity of the patient as well as audio record of clinical episodes in the patient's ward. one advanced digital HD video camera with night mode – optical zoom, rotator, wall mount. two advanced digital HD video cameras with night mode – optical zoom, rotator, wall mount. Event marker (wireless) for medical staff and patient. 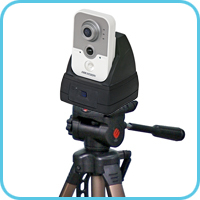 The option of increasing the number of video cameras up to 4 pcs. The option to backup the video data onto the memory card of the switching unit. Meant for continuous EEG videomonitoring near the patient and can easily fit in a compact carrying case. Patient is placed into usual environment (a functional diagnostic room, hospital ward or at home) - they can sleep, eat, read, watch TV, play, etc. A doctor or an assistant monitors their state, operation of the equipment and recording quality. Due to its small size and data transmission to the doctor's PC via the Bluetooth interface, the kit can be easily placed in the intensive care units and will not hinder resuscitation and seriously ill patients' care. Option to backup the video data onto the memory card. 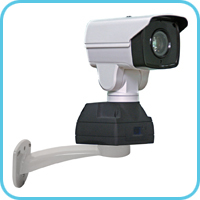 IR-lamp for quality video recording in darkness – provides soft IR light reflected from walls and ceiling. It can be placed anywhere in the room, without reference to other elements. portable stand for camera or a clip for camera fixation. Real time station (doctor's workplace) is designed to monitor and analyze data of EEG videomonitoring conducted at the moment. Station for data processing and archiving is designed to analyze, store and classify EEG videomonitoring data. An original autonomous video recorder with an option of video record synchronized with EEG data on the internal memory card sets up a new innovative level in ambulatory EEG studies. 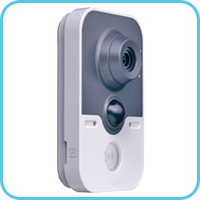 The autonomous video recorder provides continuous or fragmentary high-resolution video record (for example, 1920х1080 – at least 8 hours, 1024х768 – at least 13 hours) with IR backlight for night mode, audio record of clinical events on integrated microphone and record of patient's events with the button on the video recorder. 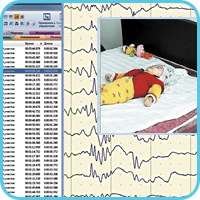 Continuous EEG record (Holter-type) is performed on the electroencephalograph-recorder memory card. Application of the original autonomous video recorder allows those present (staff, parents or relatives) to record clinically significant behavioral episodes and paroxysmal events that, in turn, provides accurate differential diagnosis. 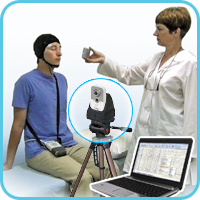 The feature of the video recorder is synchronization of recorded video with EEG data during their transmission to the computer for processing, analysis and diagnosis. Autonomous ambulatory EEG record (Holter-EEG) is recommended when the patient's freedom of movement in the natural conditions is of clinical interest. 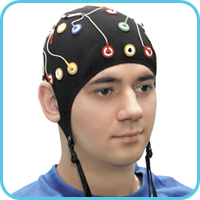 Low level of EEG electrodes and fixing slots for their attachment, and comfortable elastic net cover caps (15 sizes total – from 34 to 66) ensure comfort of a patient and high quality of EEG record during continuous study. Special thin and flexible cable with a low level of triboelectric noise decreases the number of artifacts during EEG record and provides comfort for a patient. 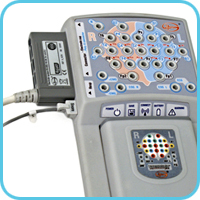 The complete set contains several types of removable electrode systems, which differ in number of EEG electrodes. Each type of electrode system has 3 variants: for adults, children and babies. 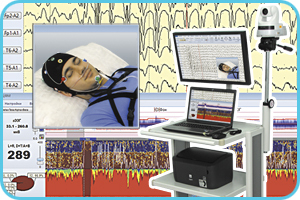 Synchronous view of EEG and video record during monitoring or subsequent analysis can be carried out on 1 or 2 monitors. The record can be viewed at normal speed, speeded-up or slowed-down. 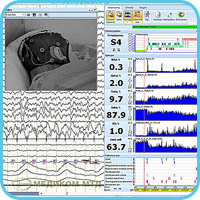 A still frame mode and quick access to any EEG videomonitoring moment (by set time, markers or marks). Camera tilt and zoom (optical and digital) are software-controlled. Up to 10 standard settings of camera tilt and zooming are stored in software. Timing accuracy of EEG signals and video data during record and playback – 1 frame. 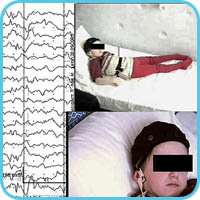 An option of both automatic and manual marking of different events during EEG videomonitoring. 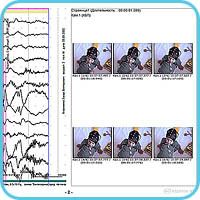 Quick access to the video frame corresponding to the selected time on EEG record, and any EEG fragment corresponding to the selected video frame is provided. 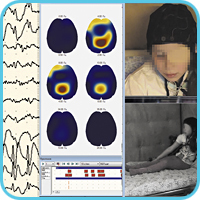 Automatic detection and marking of fragments of non-stationarities or epileptiform activity is performed during EEG recording and processing. Detected fragments are highlighted, saved and available for quick search. Record of ECG, EOG and EMG synchronously with EEG provides automatic suppression of possible artifacts associated with cardio signal, eye movements and muscle activity, and helps to distinguish these artifacts from the manifestations of paroxysmal activity. Automatic report generation based on the description of the selected background fragment and comparison of its characteristics with the selected EEG fragments. An option of editing the report and forming neurophysiological conclusion using the function of built-in text editor and a glossary containing common phrases used by a doctor. Specialized application "Encephalan-EEG-Viewer" to view EEG and video data at any off-site computer ensures main functions of visual EEG analysis such as data review, referential montage, zoom, selection of EEG signals and printing out required files. Application and study results are recorded onto any data-storage device – removable hard drive, CD-DVD or USB drive. All recorded data can be stored on various data-storage devices (internal or external hard disk drives of large capacity) in the database (Cardfile). Cardfile provides various service capabilities for storage (archiving), systematization and search. For EEG analysis, the most common mathematical treatments are applied: power and amplitude spectrum; cross-spectrum, coherence function, auto- and cross-correlation with the generation of the tables of quantitative parameters and topographic mapping. 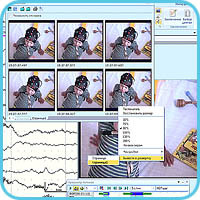 The main peculiarity of "Encephalan-Video" software is an option of presenting results of EEG videomonitoring in the form of video clip in the common *.avi format. Video clips are used for independent medical consul­tations, discussion of the diagnosis, presentations and reports preparation, handing over to a patient, etc. The video clip can be viewed with standard Windows Media player or any similar one. 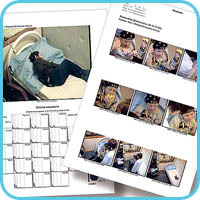 The video clip can contain diagnostically significant EEG fragments, video data of one or two video cameras, audio data from patient's and doctor's microphones, and a timer. Print manager ensures comfortable and quick generation of the documents for printing out by carried out study. A user can edit available templates and create the new ones. 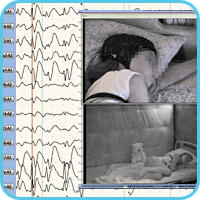 EEG record during sleep is highly recommended: "The intensity of the epileptic activity is increased in sleep stages 1 and 2". (Sweden B., 1996; Autret A, et al., 1999). "Neurological" and "maximum" suits of "Encephalan-PSG" software for somnological studies in combination with video-EEG monitoring kit provide wide range of functional capabilities for sleep analysis and detection of epileptiform activity in sleep taking into account recommendations of the AASM and the CSM. 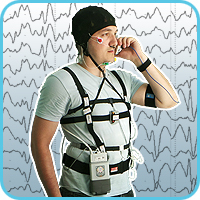 "Neurological" software suit is additionally used for sleep stages determination and comparing them with epiactivity evidences during EEG videomonitoring. Software provides analysis of sleep stages, automatic building and manual editing of hypnogramms, allocation of sleep events, generation of sleep statistic reports and reports of sleep stages distribution. Data from additional wireless devices is not analyzed. Analysis of breathing and movement disorders is not available. Software suit "Maximal" with additional wireless modules and sensors contains all the necessary functionality for polysomnographic studies of an expert level, in accordance with international professional recommendations of AASM and CSM. heart rate and coronary heart disease. selected sleep events (indices, the number and duration of episodes). 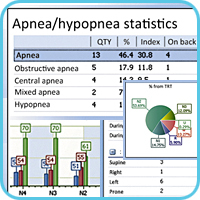 Generated reports contain such data as indices of snoring, desaturation and respiratory disorders according to body position, data on the change of oxygen saturation and heart rate, and body position in sleep, that conform to common international somnology standards (AASM).